& blue color scheme. 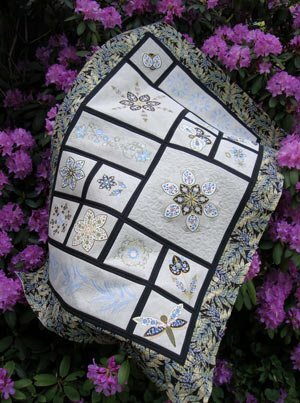 Notice the background quilting on each block The Embroidery Quilt Block of the Month program is a great way to get involved in the exciting world of quilting with machine embroidery! Your 6-class course includes hands-on training covering in-the-hoop appliqué, standard embroidery, tufted satins, line quilting, and quilt construction with an expert instructor. The class will meet every other month and you will have homework to complete between classes. The cost of this class will include the designs already manipulated to fit the quilt blocks so you will not need to have the Designer Software in order to create it. Designs will be available in .exp and .art formats. Please let us know if you need a different format. Pick out your own color way and create a masterpiece.